Do you have paraskevidekatriaphobia — a morbid, irrational fear of Friday the 13th? If you do, this year will be difficult. Tomorrow is the second of three Friday the 13ths this year. I found 13 links for Friday the 13th to help you avoid bad luck and attract good luck. But perhaps your fear isn’t morbid or irrational. Sill pushing your luck on the day of bad luck, especially when it seems that the bad luck could be doubled or tripled when that ill-fated day will reoccur more than once in a single year, may not be wise. Knock-on-wood and fingers crossed, this mash-up of superstitions associated with Friday the 13th is intended to help you get through the day. 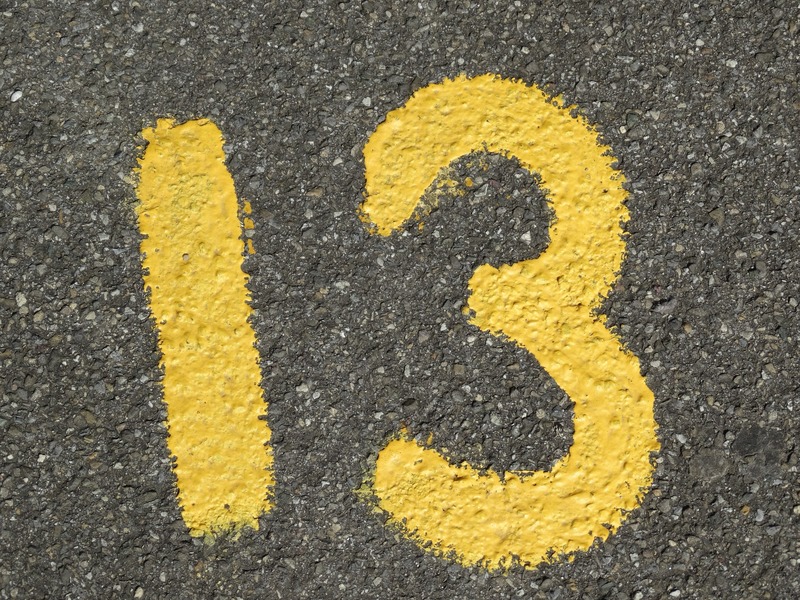 This post lists 13 Strange Things that Happened on Friday the 13th. This site has an unfortunate number of intrusive ads, but if you can get past those it has some fun posts about life’s little mysteries. It’s the kind of site that I can spend a lot of time just wandering around. This site explores Three Food Myths. Another site that’s fun to peruse, you can learn the history behind some Common (But Silly) Superstitions at live science dot com. A feng shui ritual is included in this post by lucky path. Cross your fingers or use one of these eight unusual Good Luck Charms from history. 1130 the Tiger and their listeners suggest several Ways to Beat Bad Luck on Friday the 13th. The number 13 is associated with bad luck according to wish good luck. Surely the Farmer’s Almanac offers down-to-earth advice in its post 13 Ways to Improve your Luck. This site includes old English Good Luck Superstitions. At Ancient Symbols there are Good Luck Symbols from a variety of nations, time periods and areas of study such as Alchemy. And finally, learn how we can make our own good luck. How? Just believe. According to this study, some Superstitions Bring Real Luck. I have been known to knock-on-wood and cross my fingers. And I believe that the full moon brings out the crazies. But I don’t believe that the poor black cat has any special unlucky properties. Do you? Had you heard of all these superstitions and good luck charms mentioned in these 13 links for Friday the 13th? Which superstitions do you follow? You know, August. I’d never thought of it that way before, but you’re right. The good things that happen on Friday the 13th have to have super-duper good luck! Thanks for stopping by. What’s the word for a sincere adoration for Friday the 13th? 😉 Thanks for the great links, Lynette. I guess you could say I’m superstitious with numbers. I consider myself lucky if I spot my faves on the clock, or anywhere. what fun, Lynnette. who knew half this stuff? Now I’ve got to read even more sites and blogs. have a great weekend. Thanks, Louise. You have a good one, too! Fun links. Thank you for sharing. Superstitions are really fascinating. I try not to jinx things by gushing about something that isn’t certain yet. Oh, I know what you mean about not trying to jinx things! Thanks so much for sharing Reetta!